This is a whole system for creativity in magic. 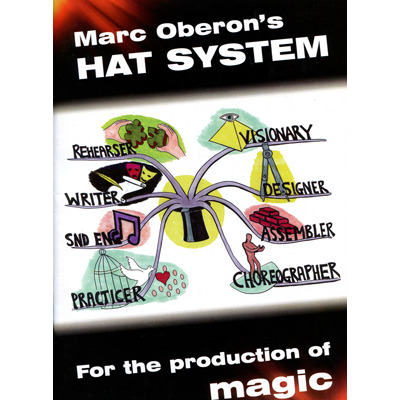 Marc has eight metaphoric "hats" you wear so that you can excel in the choreography, construction, and deceptiveness in magic. Instead of putting on a "thinking cap", in the HATS system you put on a "hat" instead. That is not a real hat, of course; just one that you visualize yourself wearing as part of the thought process. There are a total of eight of them in my system. Each hat represents a role that you play in the production process. The name given to the hat illustrates a state of mind or an attitude that you need to develop before moving on to wear the next one. I have produced a mind map for each of the hats. My original diagrams use colour to help emphasize the different branches of thought. If it helps you to grasp the principle better, then use a highlighter or felt tip to go over each line. You will also notice that I have made liberal use of different graphical symbols - light bulbs, eyes, foot-prints and the like to illustrate thoughts at different points. I suggest that you use similar symbols in your own mapping projects, developing your own unique visual clues as you go along.